Brushing your teeth is not just a daily chore for people on Earth. Good teeth are vital for astronauts in space, but not for reasons you might think. In new video about astronauts and their teeth, the European Space Agency took the streets to find out what people across Europe thought are the reasons spaceflyers need to keep their pearly whites in good shape. While ESA officials revealed the surprising answer to space dental health in the video's end, some public answers ranged from the sensible to outright odd. 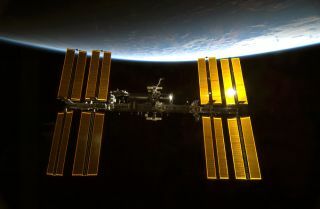 "I think in space the circumstances are different and that your bones lose calcium, and then your teeth become bad more quickly," responded one Dutch-speaking interviewee. Why Do Astronauts Need Good Teeth? Astronauts do lose bone density while living in space, but that isn't the reason they need to take care of their teeth. Other interviewees came up with more creative reasons for astronaut dental care. "Because it is weightlessness, there is no traction between the food and the teeth," said a person interviewed in Brussels, Belgium. "So I think it is very hard, very difficult to make the food digestible in the stomach." Another respondent thought speed might be a factor. "Because of the speed you are travelling with? I don't know," said one interviewee in Maastricht, Netherlands. "In fact, astronauts need good teeth because the acceleration forces and vibrations during a flight into space can be very strong," an ESA narrator says in the video. "During the launch phase, an astronaut has to endure a force of up to four times their own body weight. Ill-fitting dental fillings could become loose or fall out, and the atmospheric pressure change may be painful when cavities are present." Good dental hygiene does not stop on the ground. Spaceflyers need to continue taking care of their teeth while living on board the orbiting laboratory in preparation for their return to the surface of the Earth. When space station residents are done with their time in orbit and return home, it's also a violent trip. The Russian Soyuz capsule responsible for taking spaceflyers to and from the $100 billion laboratory is still speeding at about 6.2 miles per hour (10 km/h) when it touches down. So if you have hopes to be an astronaut, don't forget to brush your teeth each day. It's a good practice whether you live on Earth or not. Follow staff writer Miriam Kramer @mirikramer . Follow us @Spacedotcom, Facebook or Google+. This article was first published on SPACE.com.